At the first working session of the 9th International Public Markets Conference in Barcelona, participants discussed how public markets can stay relevant in today’s competitive marketplace. Because the success of a public market depends on its ability to remain flexible, as moderator and PPS Vice President Kelly Verel described, “market operators are often leading the charge on what is new and innovative.” With presentations from three diverse panelists, each deeply invested in the future of markets in the United States and abroad, the resounding theme of the session was that just as the very definition of public markets is in constant flux, so too must our operational strategies continue to evolve in order to meet the changing needs of today’s customers. Is today’s public market a place to buy food, to sit and eat a meal, or to have a unique educational or culinary experience? Can it be all of these things? Is it a place that can foster connections not only at the point of purchase, but can it also breed social connections as well as and connections within the food system and between small farmers and local consumers? In thinking about how best to ensure the success of any public market, Larry Lund, economic analyst and Principal of the Chicago-based Real Estate Planning Group, has a motto: “You do not get to select your customers, your customers select you.” Understanding the needs and desires of today’s consumer, he argues, is the single most important factor that will determine a market’s success. To help participants gain a better sense of who this new consumer is, Lund began this discussion by highlighting recent cultural and demographic trends that reflect some major changes in the ways we produce, consume, and distribute food throughout the United States. Another trend: consumers are becoming more and more concerned with knowing the source of their food. 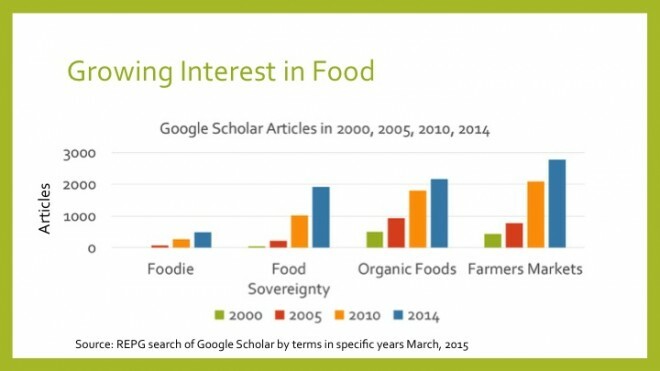 While interest in organic food continues to increase, its growth has declined significantly since 2010. Lund believes (and much research confirms) that the progress of the “organic” movement has been offset by the more recent “locavore” movement, where people are foregoing organic products in favor of locally sourced food. Why this trend towards localism, and why now? For one, it’s a way for consumers to counter and resist the globalization of food systems. In a time where “15 multinational companies control 30% of the world market,” Lund explains, people want greater local control over their food. “They want freshness,” he adds, “they want to support the local economy, especially during recessions, and they want food security—this idea of knowing and trusting your farmer and buying directly from him or her.” In addition, because of their important role in local food systems farmers markets have become the fastest growing food distribution channel. Cultural shifts such as declining household size and an increasing number of nonfamily households since the 1960s have also led to changes in contemporary eating habits. While Americans ate only 20% of their food away from home in 1961, for example, today this number exceeds 40%, and this decrease in “planned eating” at home has led to a greater demand for more convenient prepared food options. 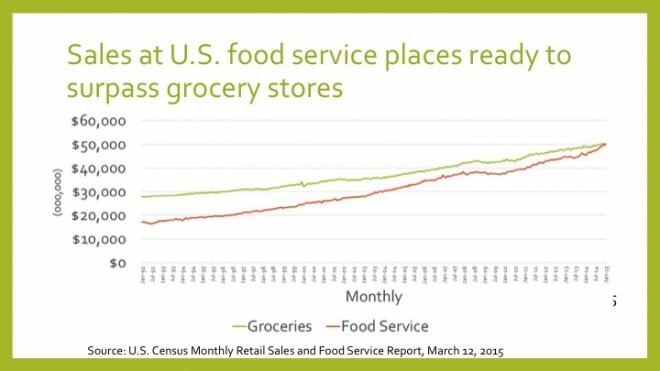 In fact, Lund reports that for the first time in U.S. history, dollars spent at food service places are ready to surpass grocery stores. In the late 1990s, Rotterdam’s central outdoor market was in serious decline. With the increasing dominance of supermarkets throughout much of Northern Europe, Germany, and other parts of the UK, Rotterdam’s market was struggling to remain viable and relevant. Its selective hours of operation made it inaccessible for many, there were safety issues and few public facilities, and there was little variety in product offerings. The most crucial cause of the public market’s decline, though, was that it was failing to respond to the changing needs of everyday consumers. With this in mind, in 2004 a team of developers, architects, and council members, began mapping plans for a visionary multi-million dollar public-private market venture. Housed in an iconic architectural structure that takes up an entire apartment block, Markthal is a remarkable hybrid space that represents a new frontier of markets. Along with over 500 vendor stalls and retail shops, the building contains numerous restaurants and cafés, an underground supermarket, a massive parking garage, and 230 residential housing units. 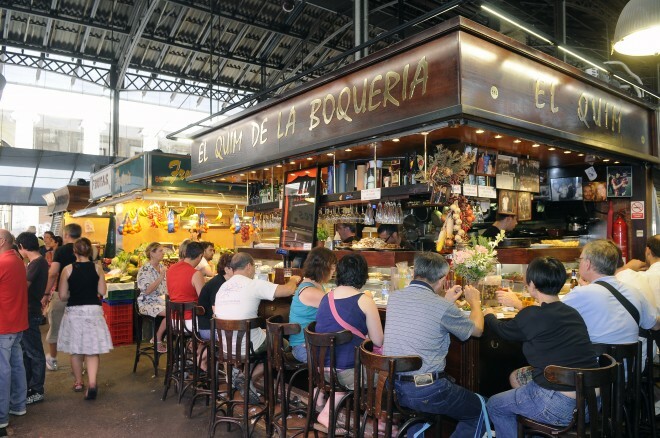 The market serves an average of 135,000 visitors a week, and by the end of its first year it is expected have served from 7 to 10 million visitors. 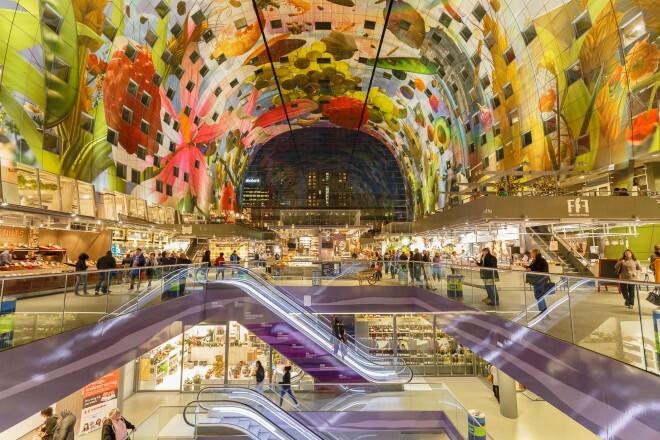 Rotterdam’s Markthal is still in its infancy, and the management team is constantly tweaking their offerings and marketing efforts. Already, in just this first year, there have been many unpredicted outcomes. While drawing customers has certainly not been a problem, given the striking context of the market (the building itself is a stunning architectural feat), the market has struggled to attract a younger customer base. In thinking about how to better appeal to this important demographic, the team also would like to see visitors returning for the content of the market (the quality and variety of its local produce, for example) rather than its context alone. As the market will continue to prioritize the changing needs its customers, Van Gool stresses the importance of remaining flexible and adaptable in order to ensure the relevance and longevity of a market. In addition to a revived focus on the customer experience, many of today’s markets are also responding to a rising interest in food security and “buying locally.” In the United States, as part of this movement to increase a community’s access to fresh local food, market enterprises such as New York’s network of Greenmarkets are incorporating the emergence food hubs, community supported agriculture (CSAs), and wholesale market opportunities into their program models. The panel’s final presenter, Marcel Van Ooyen, is executive director of the nonprofit GrowNYC-Greenmarket, the largest open-air farmers market program in the United States. In managing nearly 70 markets, the organization has two primary goals: (1) to support small family farmers in the northeast United States; and (2) to provide all New Yorkers access to healthy, fresh produce. 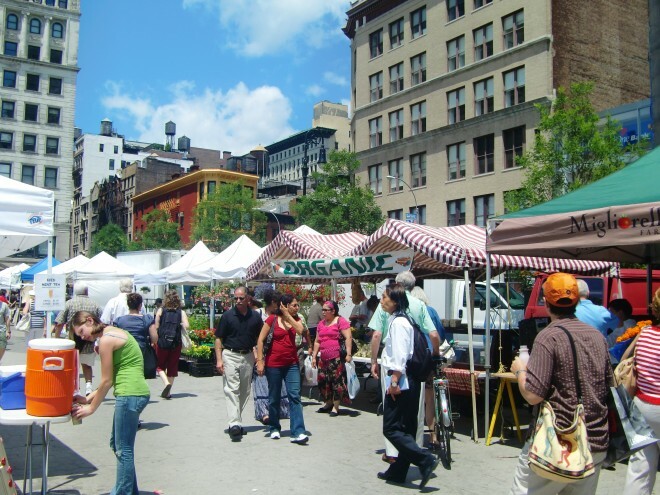 Since many New Yorkers don’t always have the chance to spend much time outside of the city, Greenmarkets ensure that customers can directly connect with the person who grew their food, not a reseller. This establishes a stronger rural-urban community connection and provides an added layer of sociability to the market. Greenmarket also runs a wholesale warehouse that ships produce to local schools, senior centers, restaurants, and publicly run programs like soup kitchens and food banks. “This has helped us add a whole new segment of farmers that we’re helping to protect in the region,” Van Ooyen explained. Another key priority for GrowNYC is providing access and availability to all communities, regardless of age, background, location, or income-level. 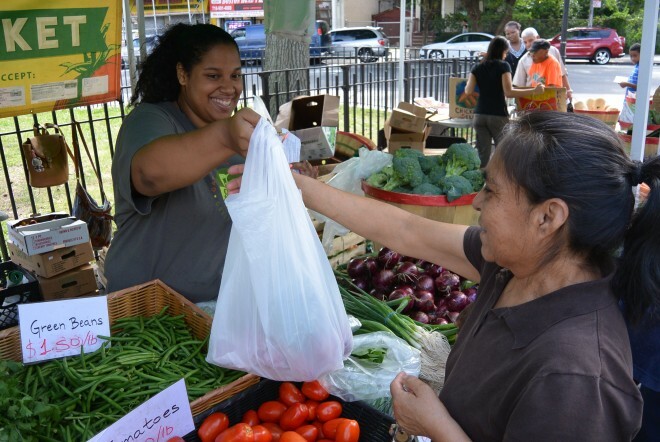 To do this, Greenmarket, in partnership with New York City's Department of Health, has implemented Health Bucks, a hugely successful incentive program wherein low-income communities can use the Federally-funded Supplemental Nutrition Assistance Program (SNAP), formerly known as food stamps, to purchase fresh produce at the market. For every five dollars these customers spend at the market, they receive an extra two dollars, which amounts to a 40% increase in buying power. The organization also runs a Youthmarket program—a network of urban farm stands operated by neighborhood youth, supplied by local farmers, and designed to bring fresh fruits and vegetables to communities throughout New York City. Greenmarket is constantly developing new ways to keep their markets inclusive and interesting, especially for younger crowds. Along with Youthmarkets, they also hold seasonal night markets where visitors can enjoy live music as they shop, a meal prepared by participating local restaurants and chefs, or they can relax with a cocktail at the beer and cider garden. With pop-up markets, sustainability and recycling centers, and multiple community outreach efforts, and exciting programs and events, GrowNYC-Greenmarket is a model of how public markets can thrive through creativity and innovation. It is also a testament to the important role that public markets continue to play in supporting healthy and sustainable communities. If we look closely at each these trends—changes in eating habits and preferences, increasing concern over where our food comes from, the decline of big-box grocery store sales in favor of farmers markets and specialty shops, for example—we might see that the driving force behind them all is a growing desire for connectivity. As Larry Lund pointed out, “It’s all about the sense of place.” People are looking for a place to gather, to connect and participate, and they are “searching out places where they can do this—even in the grocery store.” Even mainstream supermarkets are evolving to create a more multidimensional shopping experience. Along with expanding their prepared-food options, a growing number of these retail spaces now include amenities like on-site cafés, restaurants, and dining areas. As evidenced so clearly during these discussions—and throughout the entire 2015 Public Markets Conference as a whole—today’s markets are more and more becoming community hubs where visitors can gather, shop, eat, socialize, and learn. Many of these new hybrid spaces are “changing the way we define a market,” as Larry Lund concluded, and they will continue to appeal to a public that is searching as much for place and connection as they are for quality and freshness.